Kulfi has been on my mind a lot over the past few weeks. It’s one of those things that I absolutely love but have never had the guts to try and make for myself. One of the reasons is that I feel it would be sacrilege to even attempt to replicate my favourite kulfi ever — the malai kulfi from Krishna di Kulfi at Pandara Road Market in Delhi. It is the creamiest, most delicious kulfi I have ever tasted. An equally important reason is that the main ingredient of a kulfi is something I just don’t have — a whole lot of patience! 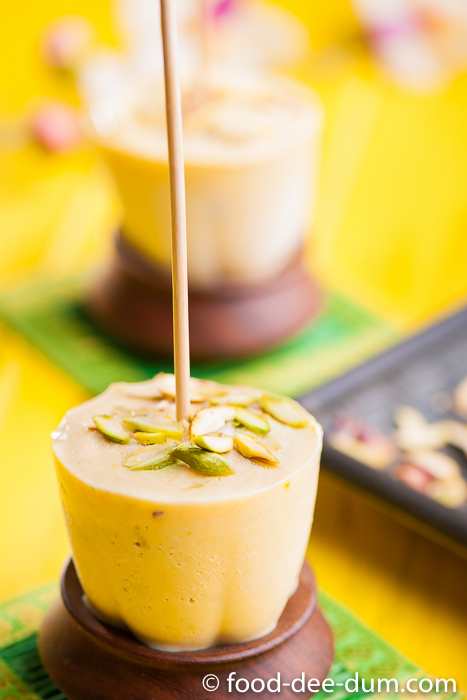 Proper kulfi is made by lovingly reducing milk until it is a lusciously thick, rich and creamy custard – stirring and scraping at the pot to ensure that the milk doesn’t stick to the bottom or burn. It is definitely not made by glaring at the pot of milk and willing it to reduce by the sheer force of your impatience. Even though the quick-fix, cheat recipes using tinned condensed milk or khoya (reduced & dried milk) taste pretty good too, I’m one of those who believes in the proper way. The result of which has been that I just haven’t had the guts to try. I have zero patience for reducing milk, as required by most of my favourite Indian dairy-based desserts. I glare and glare and frown and glare some more at the milk pot. I rarely work with quantities more than 1 litre at a time because I just can’t take more of the reduction process! So I decided I would also do a semi-cheat and start easy with a fruit kulfi, thereby reducing my reduction efforts to half! Pun intended. At this point, I should mention that I favour the matka kulfi (set in an earthen pot) over the stick kulfi (the popsicle version) — any given day. Simply because I think the unglazed matkas (pots) give the kulfi much more creaminess by absorbing all the extra moisture. The plastic/metal moulds just can’t rival that effect. Yesterday, I found myself staring at a stash of (almost) overripe guavas in my fridge and decided that they would have to do for my first time experiment. 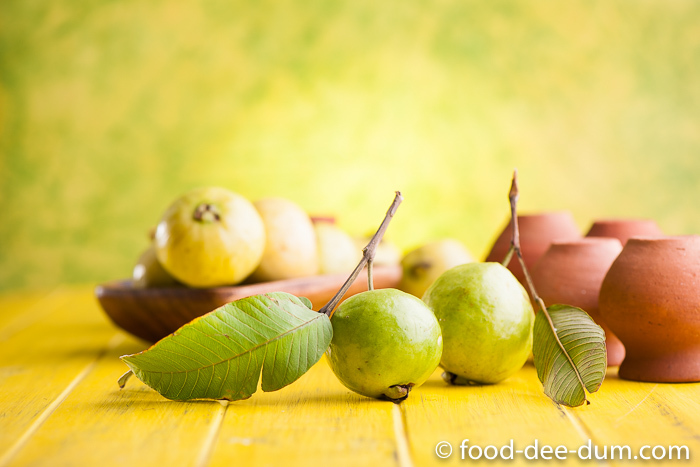 Having missed out on the mango season and the best of the chikoo season, I figured it was the guava’s turn to shine! My true loves in the fruit-kulfi department are sitaphal (custard apple) and anjeer (fig) kulfi. I’ve had them on sticks many times but I’m determined to try out the matka version when I can get my hands on a good, fresh stash of these fruits. For now, let’s talk about amrood! First, I washed, peeled and roughly chopped the amrood and put them in a blender to puree. I wanted to get this out of the way because I didn’t want any distraction while reducing the milk. Once pureed, I passed the pulp through a sieve to get rid of the hard seeds. 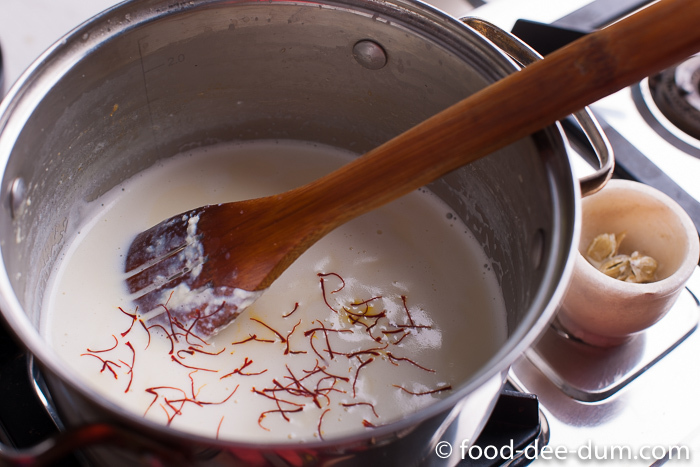 Keeping the pulp aside, I set the milk to boil in a heavy bottomed pan, along with the pounded cardamom seeds. While the milk was boiling, I made a thin paste with cornflour, milk powder and a few tbsp of water and set it aside. The reason I want to use this is because guava is not a creamy fruit — it doesn’t puree into a silky smooth pulp like bananas, mangoes or chikoo. I think the milk powder+cornflour adds a little silky creaminess to the fruit part of this kulfi. You can totally avoid it if you feel like it. When the milk came to a boil, I reduced the heat to medium and cooked it until it reduced to a little less than half. This took about 18-20 minutes, with some furious stirring & scraping to prevent the milk from sticking to the pan or scorching. Trust me, that tastes pretty bad and you should just toss that batch of milk if it happens. Once the milk had reduced, I further lowered the heat to minimum and added the sugar and stirred gently until dissolved. Then I added the milk powder+cornflour paste, stirring constantly, to avoid lumps. I let this cook for 2 minutes and turned off the heat. I fished out the cardamom pods (just the skin) and discarded them before adding the saffron and giving it a good stir. The mixture was smooth and thick, if a little bit grainy because of the guava texture. Allowing this to cool, I transferred it into a steel dabba (container) with a lid once it returned to room temperature. I placed this in the freezer for about 4 hours to allow it to semi-set. When I pulled it out, it had set into a chilled custard-y mass. I popped it all in the mixie and blended to smoothen it out and get rid of ice crystals. 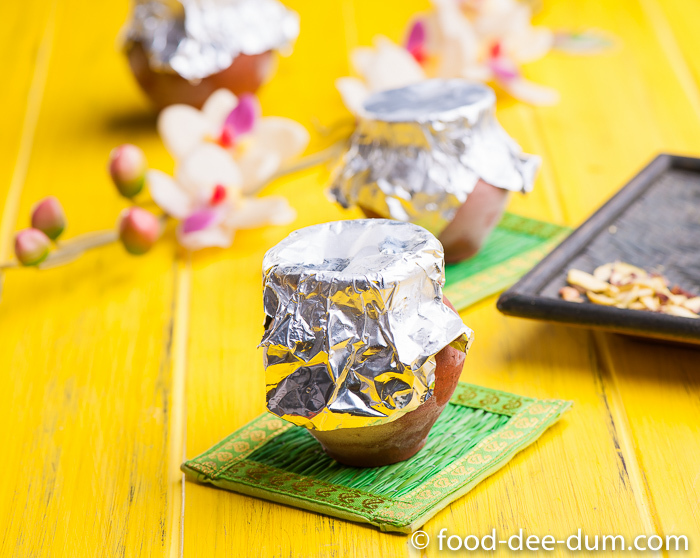 I added the crushed nuts and mixed them in before pouring the kulfi mix into washed matkas — adding a few more nuts on top. I had only 8 matkas so I poured the rest into some silicon cupcake moulds. 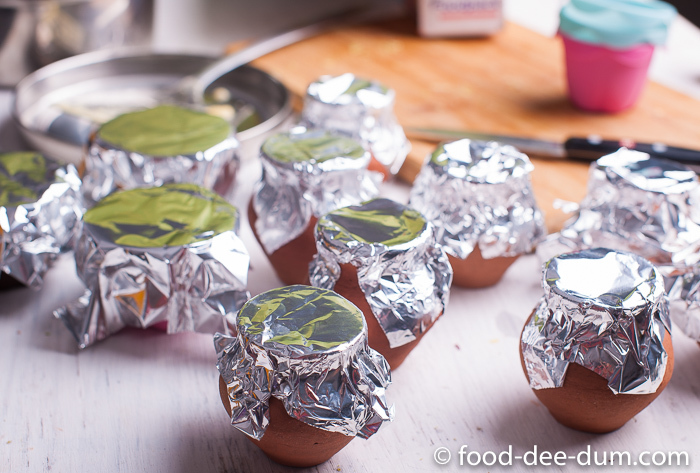 I covered them all with little squares of foil and placed them in the freezer overnight. You will need to freeze them for for at least 6-8 hours. 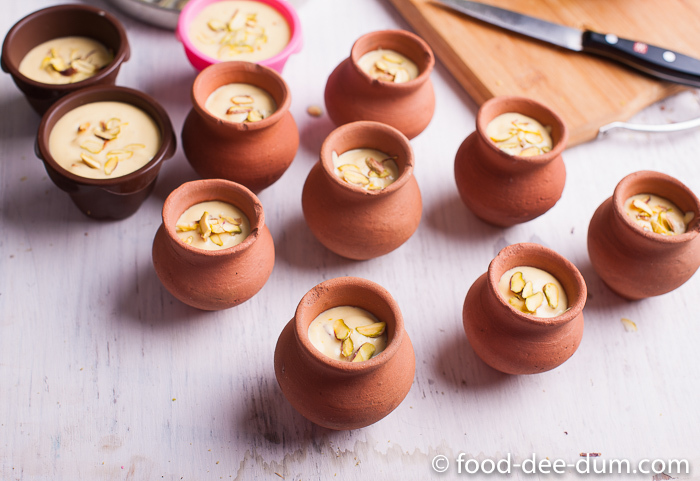 For the matka kulfis, all I needed to do was dig in! For the moulded ones, I rubbed them between my palms for a few seconds to loosen them and then stuck a skewer in the centre before pulling them out. 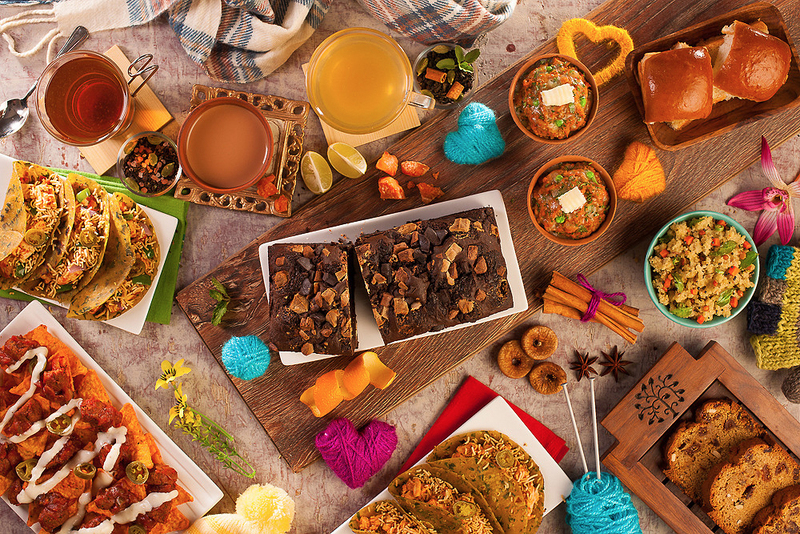 Ideally, if you’re going to use kulfi sticks/ skewers, add them in halfway through freezing. The kulfi freezes on it, making it more slip-proof! 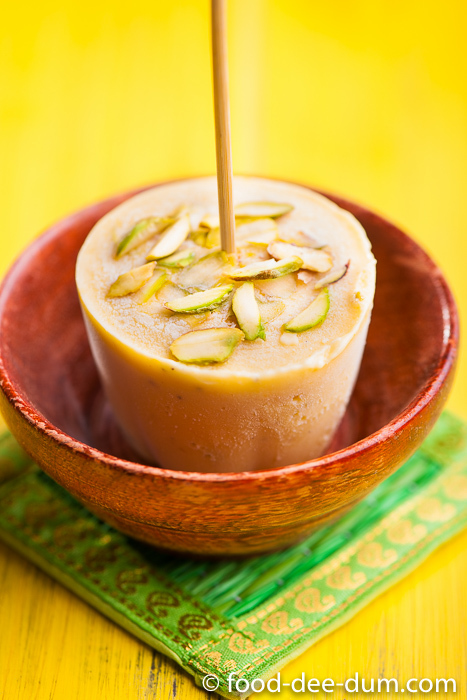 The guava flavour was just right in this kulfi, adding a bit of fruity, grainy texture to the creaminess of the kulfi. I think fruit kulfi is going to be my thing for a while. And just think of all the different fruits out there just waiting to be added to kulfi!! Sitaphal & anjeer are on my list for now and anything else that captures my fancy! Have you tried any fruit kulfis? 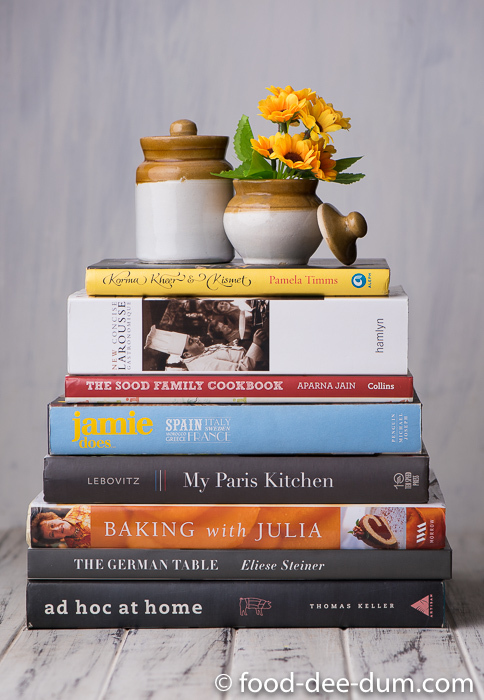 Share your experience/recipe with me in the comments below. Note: if possible, next time I will give the kulfi mixture a second round of semi-freezing & blending before pouring it into the matkas or moulds. Even though it was mostly creamy, there were still a few ice crystals that bothered me. I’m sure a second round won’t hurt! 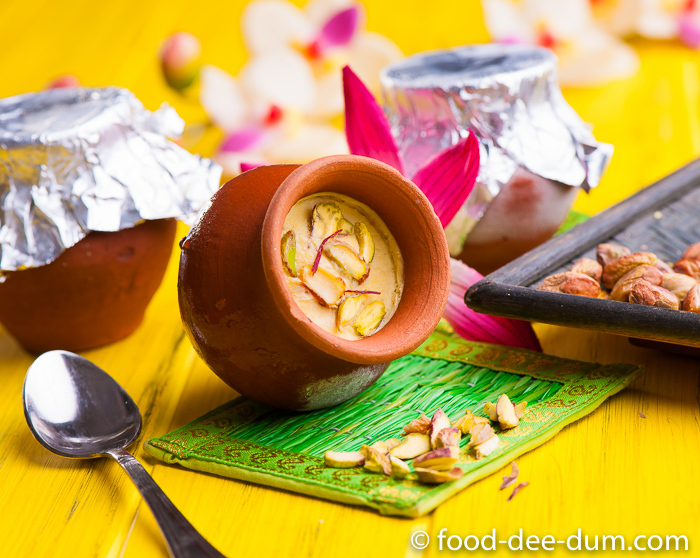 Traditional Indian Ice Cream with flavours of guava and saffron - an easy and flavourful dessert, perfect for festive occasions. 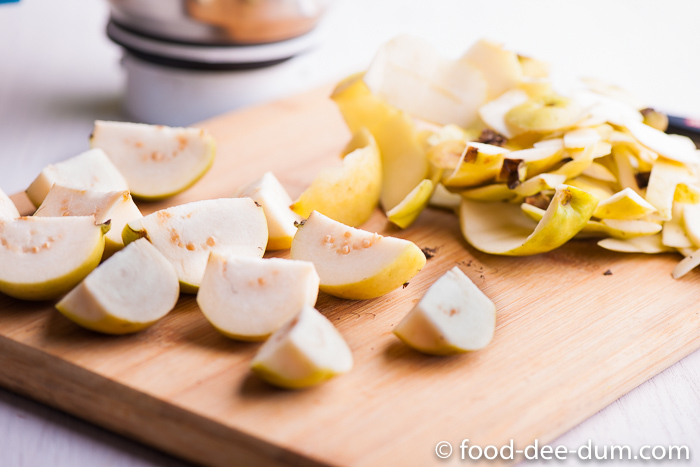 Wash, peel and roughly chop the guavas. Put them in the blender and puree them. This should make approx 1 cup of puree. Pass through a sieve and discard the hard seeds. Keep aside. 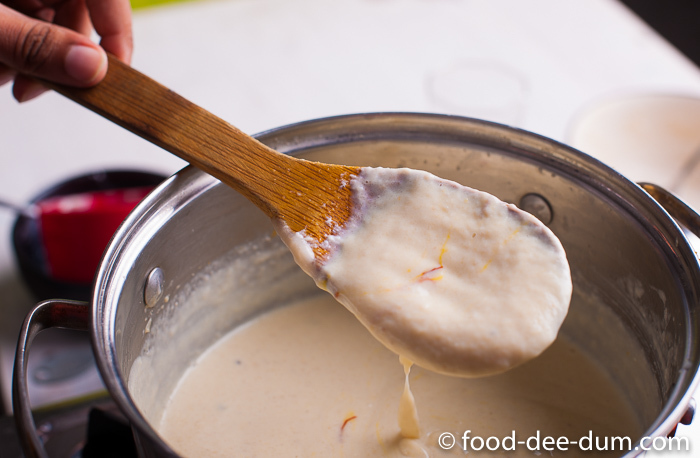 Place the milk in a heavy bottomed saucepan and set to boil along with the cardamom pods. While the milk is heating, make a thin paste of the cornflour and milk powder along with a few tbsp of water and set aside. 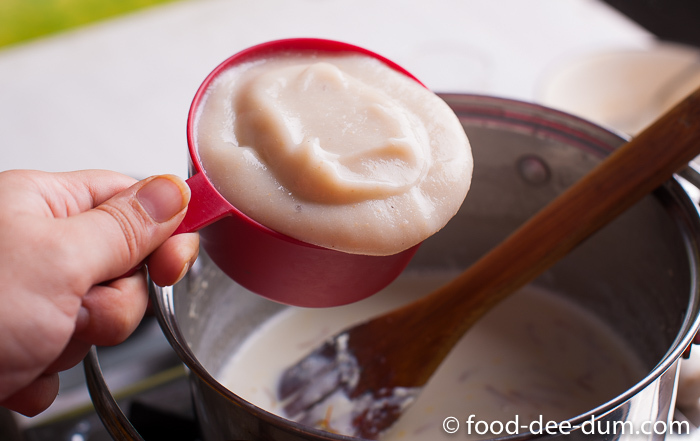 (If using condensed milk, then just make a paste of the cornflour). 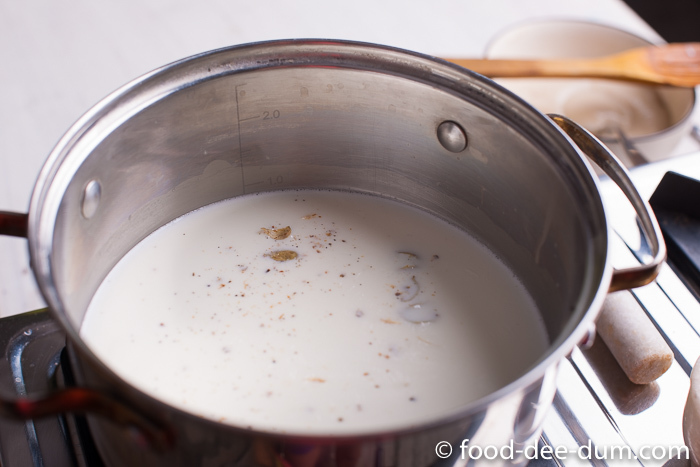 Once the milk comes to a boil, reduce the heat to medium and cook until it reduces to little less than half, stirring and scraping the bottom+sides constantly to prevent the milk from sticking and scorching. This should take about 18-20 minutes. Once it has reduced, lower the heat to minimum and add the sugar. Stir to dissolve. 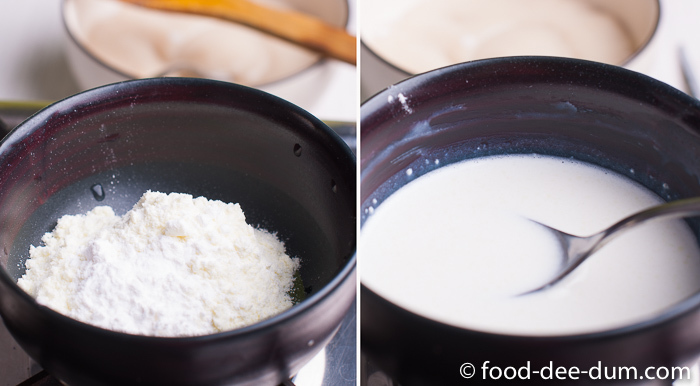 Add the cornflour+milk powder paste and stir constantly to prevent the formation of lumps. 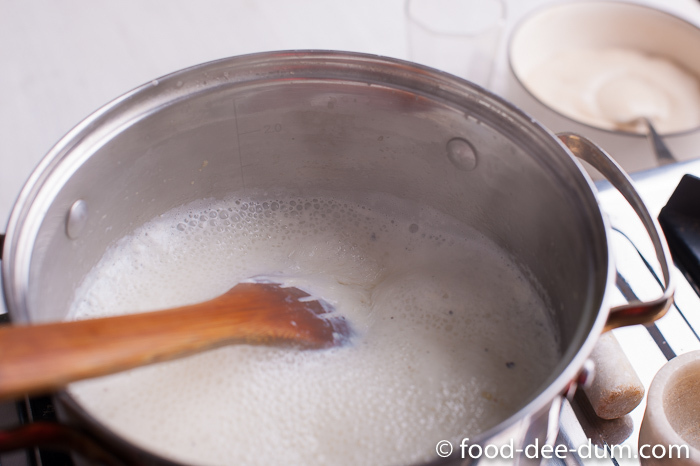 If using condensed milk, add it first and stir before adding the cornflour paste. Simmer for 2-3 minutes until everything is well incorporated and turn off the heat. The mixture should have thickened slightly. Fish out the cardamom pod skins and discard. Add the saffron strands and stir. Add the guava puree and stir well, again to prevent the formation of lumps. Now the mixture should be of a thick custard consistency. Allow this to return to room temperature and transfer to a steel/ plastic freezer proof container with a lid. Chill in the freezer for about 4 hours. 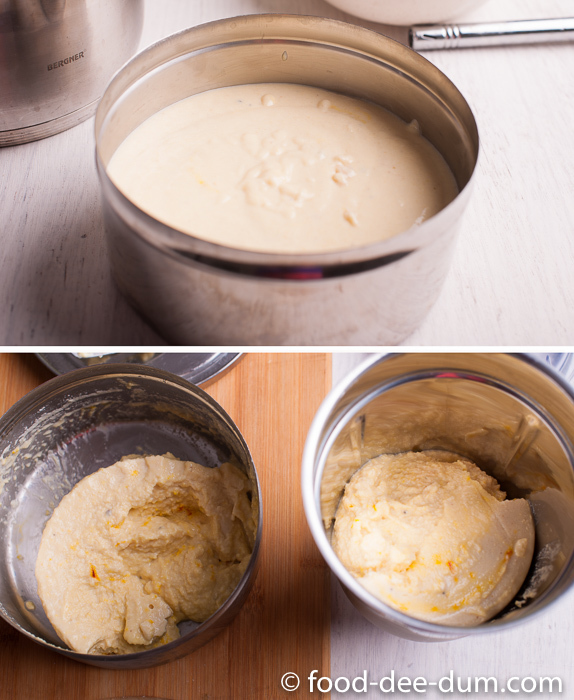 Transfer to a blender and whizz for a few minutes until smooth and creamy again. Stir in the crushed nuts. 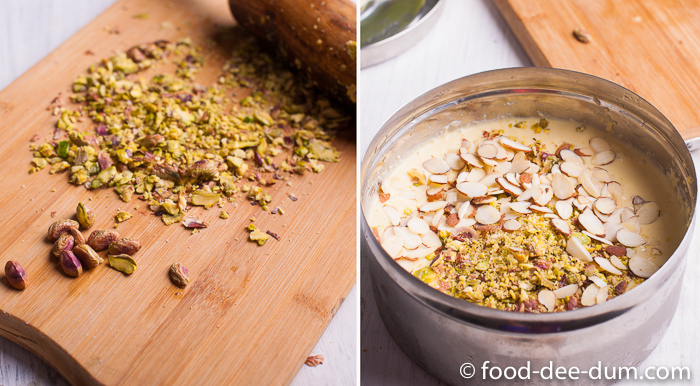 Pour this mixture into washed earthen matkas/pots or kulfi moulds and top with a few more slivered pistachios. Freeze over-night (at least 6-8 hours). 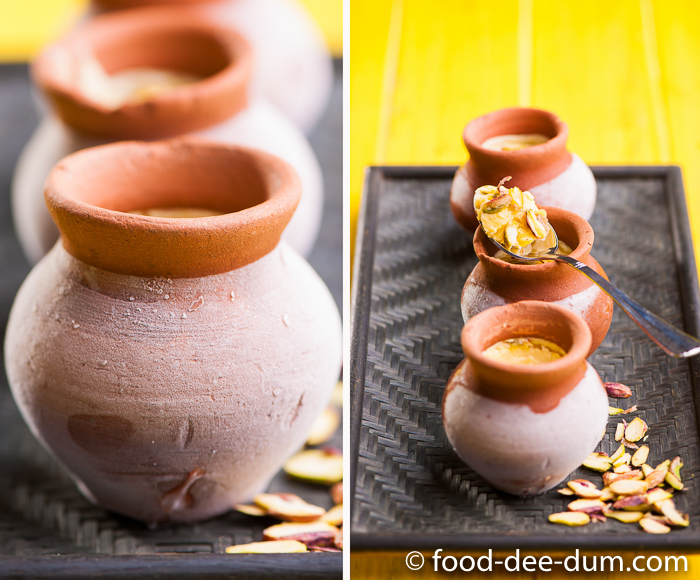 If set in earthen pots, they can be served as is, along with a spoon. If you put them in moulds, either quickly dip into warm water or rub between the palms of your hands to loosen them and unmould to serve. 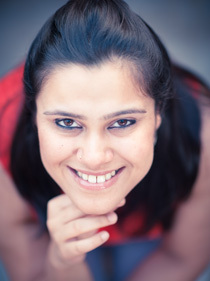 This Recipe is an entry to The KitchenAid India Navratri Challenge for The Hub @ Archana’s Kitchen. For those observing the fast, depending on the fasting rules of your family and elders, you can omit the cornflour from the recipe.